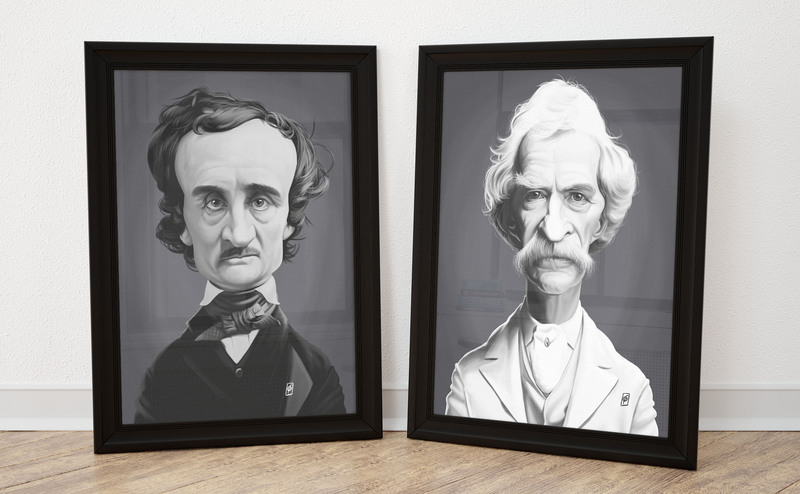 After a recent caricature portrait of Edgar Allan Poe, I thought to continue the ‘writer’ theme and do Mark Twain. The art tends to start as a pencil drawing, and many a time I have found that even though the drawing doesn’t look exactly as I want it to, the persistence in believing that the art will turn out eventually, also occurred in this example. The really nice thing about doing these artworks digitally is that the process can include some raw and brutal correction; with some ease. I added the scan of the pencil drawing in on the morning of the rendering, and realised that there were several mistakes with the left side. After a quick alteration and set up, the digital painting began, and I hope you agree that the end result turned out pretty good. If you are interested in seeing the painting process as well as the before and after comparison, then it can be found here! If you have any interest in buying the print, or both “great writer” prints then you can find those in the store, or at any of the online venues I sell. I believe that the series will continue, and have already looked at Walt Whitman as a next possible candidate. These aim to be a writer series that could end up as a calendar or a nice addition to the walls of some literature fan. For now, Mark Twain is the second writer in the series, but if you feel you know any writer that may fit the bill then send a suggestion on the contact form. Others to consider will be Kurt Vonnegut, Richard Brautigan, and William S. Burroughs. For now I hope that you enjoy the feature and process of Mark Twain and Edgar Allan Poe. Yeats? T.S. Eliot? Oscar Wilde? Emingway? Thanks for that. I would like to get as many US writers first, then I can do the calendar idea based on that principle.